Almost two decades ago, Louise Juckniess started a small consignment business out of her home. It all began with her own collection of high-end shoes, purses, and collectibles that her family had owned and loved over the years. They were still in excellent condition, but she didn’t need them anymore, so she decided to resell them. 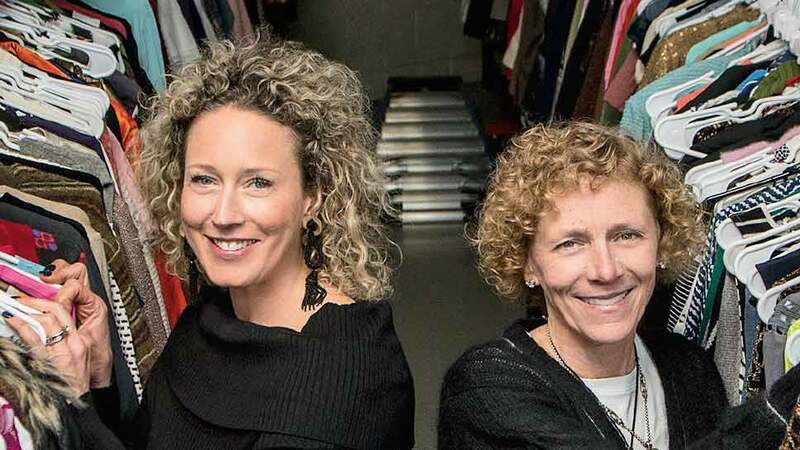 The business started to grow over time, and six years ago, Juckniess partnered with Kim Williams and founded Shop Melee, a full-service consignment and estate sale services company. Shop Melee spans the entire consignment platform, accepting a large assortment of items for consignment at its Willowbrook location for both sale online and in the warehouse, and hosting estate sales in clients’ homes. Shop Melee’s 12,000-square-foot warehouse in Willowbrook is also open to the public from 9 a.m. to 4 p.m., Monday to Friday, for drop-offs and warehouse home goods shopping. And last but not least, Shop Melee has an inventory of close to 40,000 items for sale online, which you can check out at shopmelee.com and shophautespot.com. “We have everything from contemporary clothing brands to couture and collectibles online, and sell household items and furniture in the warehouse and in people’s homes,” Juckniess says. The business has largely grown by word of mouth. A client often starts as a customer: The person buys something from Shop Melee and ends up selling with them later. Not all clients and customers are local; Shop Melee receives consignment items from all over the country, and ships all over the U.S. and globally as well. The process is fairly simple for people who want to consign with Shop Melee. Locally, clients can drop off items for consignment consideration Monday through Friday while the warehouse is open. Online, they look for authentic, contemporary, head-to-toe fashions and accessories, as well as Google-searchable collectibles. For the warehouse, Shop Melee accepts items that can be carried with two hands that are in nice condition, and they accept pre-approved items from out-of-state customers by providing prepaid shipping labels. The average shopper has become much more savvy, Williams says, especially in the era of online retail. “Buyers want a good price and they want good quality, whether buying new or used,” she explains. If you’re a customer looking to consign with Shop Melee, Williams says to ask yourself if you were to order the items online, would you be excited to receive them in the mail? If so, it’s likely someone else will as well. When Juckniess started her business, she had no way to anticipate the trends, but consignment has remained a popular option for people who have high-quality, valuable items that they don’t have a use for anymore. Consignment is a socially and fiscally smart choice. “We’re able to recycle your previously loved items. And if you spend a lot of money on something, you probably want to get something back for it,” she says. The spring season is a popular time for Shop Melee as the real estate market is back in full force and closet cleaning is all the rage. Right now, the big trends include Mid-Century Modern and contemporary decor, kitschy collectibles, colorful accessories, fringe, florals, and dark denim. If you have any of these items, call or stop by the office. “We handle everything from A to Z,” Williams adds. Shop Melee is located at 16W231 S. Frontage Road, Suite 10, in Willowbrook, 855-494-0004, shopmelee.com.